What is Public EDB (Pub1.edb) Mailboxes? Microsoft Exchange Server is the powerful email server technology which integrates agile Extensible Storage Engine (ESE) and security-enhanced Information store to facilitate seamless email communication. While coursing through the intrinsic database of Exchange Server, one will find that the information store is actually comprises of .stm and .edb files. Moreover, Exchange Server identifies the default mailbox storage database as Priv1.edb and Priv1.stm files. While on the other hand, Pub1.edb and Pub1.stm stores all the email information associated with the default public store. When you talk about the .edb file entity, then you must understand that it is an ESE database storing crucial email attachments and MAPI messages. How Exchange Dirty Shutdown State or Jet Engine Error Damages Pub1.edb? As there are many reasons of dirty shutdown state propagation, one must also understand the intricacies involved at the deepest Exchange database level. When any of the mentioned reasons arises, the Exchange Server database is unable to isolate itself from transaction log streams which impacts the consistency and integrity of database. At this instance, if you restart the Exchange Server services, then the server looks out for missing log files of data, which if went missing; creates Exchange corruption situation. In both the scenarios the fate of Public and Private EDB mailboxes is always compromised; corruption at the lowest level of Exchange database always has a ripple effects as we move deeper into the Exchange information store. In addition, the possibility of Pub1.edb corruption can't be denied in such instances which needs proactive and smart troubleshooting tactics to restore all email items. Fixing the Pub1.edb files mean entire recovery of Exchange information store using the command line prompt. Interaction with the intrinsic functionalities of Extensible Storage Engine and information store can be easily facilitated by the disaster recovery commands. Let us see how we can regenerate the damaged or corrupted Pub1.edb file. Carefully inspect the Exchange Server error and act accordingly. Stop the Exchange information store services, and then navigate to bin folder through command line interface. Input the following command: eseutil /mh ..\mdbdata\priv1.edb at the command line path: C:\exchsrvr\bin>. Press the Enter key. At this instance, check out the State of Exchange database if it is clean or not. If you find any discrepancies in the State, then you need to perform the soft recovery process after exporting the folder to the place where log files are stored. Hit the following command: C:\Program Files\exchsrvr\BIN\eseutil" /r E00 at the command line path: C:\Program Files\exchsrvr\MDBDATA>. After the application of previous command, if things are still as it is, then you need to perform the hard recovery process. At the C:\Program Files\exchsrvr\MDBDATA> command line, enter the following command: "C:\Program Files\exchsrvr\BIN\eseutil" /p pub1.edb. Navigate to the Mbdata folder, and then discard the .chk, and Temp.edb files along with log files. Formidably mount and then dismount the Exchange Server database; and cutoff the Exchange information store services. C:\Program Files\exchsrvr\BIN>eseutil /d "C:\Program Files\exchsrvr\MDBDATA\pub1.edb"
Now expertly perform the Isinteg.exe fix by entering the following command: C:\Program Files\exchsrvr\BIN>isinteg -s (servername) -fix -test alltests. Close the command prompt, and then restart the Exchange Server services to reinstate the recovery of corrupt Pub1.edb files. When the most critical dirty shutdown states and jet engine errors have reached and affected your Exchange database, then you wouldn't have to be surprised if you couldn't recover important email items even after executing the hard and soft recovery process. Hence, during such instances, one must arrange a trustworthy third-party Exchange Server recovery solution to repair all .edb files including Public as well as Private one. 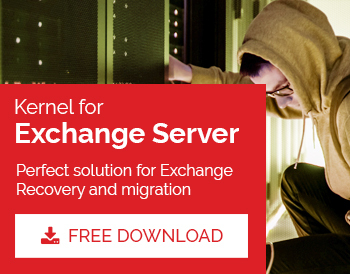 Kernel for Exchange Server is expertly optimized user-friendly solution to eliminate all severe Exchange Server errors. It assists you to recover Pub1.edb and Priv1.edb mailboxes without affecting the properties, structure, and formatting of emails. EDB to PST software is intelligently programmed to incorporate intuitive migration options like Office 365, Public Folders, Live Exchange Server, Archive Mailboxes, etc. In addition, the software works proficiently with Windows 10, MS Outlook 2016, and MS Exchange Server 2016 platforms. How to Fix Exchange Jet Engine Error? How to Mount EDB File?